Nitra is a city in western Slovakia, situated at the foot of Zobor Mountain in the valley of the river Nitra. 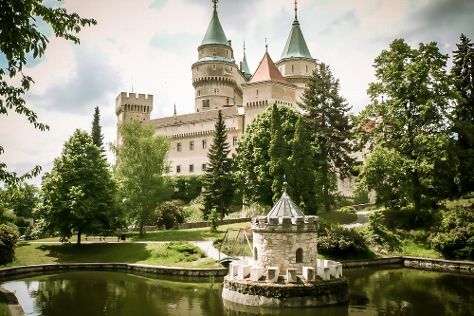 Change things up with these side-trips from Nitra: Trencin Castle (in Trencin), Banska Stiavnica (Kalvaria, Old Castle Banska Stiavnica, & more), Bojnice (SNM - Bojnice Castle Museum & Bojnice Zoo), Cicmany (in Cicmany), Cerveny Kamen Castle (in Cerveny Kamen) and Piestany (Spas & Wellness & The Colonnade Bridge). There's still lots to do: explore the historical opulence of Nitra Castle and pause for some photo ops at Black Death Column. To find traveler tips, ratings, reviews, and tourist information, you can read our Nitra itinerary planner. If you are flying in from Spain, the closest major airport is M. R. Štefánik Airport. In December in Nitra, expect temperatures between 3°C during the day and -1°C at night. Finish your sightseeing early on the 8th (Thu) so you can drive back home.